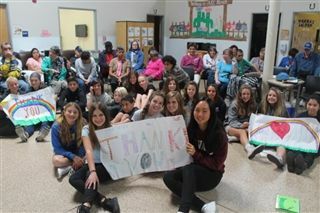 On Tuesday, May 25th, Middle School Service Learning students celebrated a year of meaningful visits to the Arc of San Diego by putting on a talent show featuring poetry, singing and dancing. Arc of San Diego, a longtime partner of the Pacific Ridge Service Learning Program, provides services to San Diego children and adults with disabilities. Throughout the year, groups of students visited Arc's San Marcos facilities weekly to engage with Arc clients over games, crafts, activities, and more. After this week's talent show, students had an opportunity to wish their Arc friends farewell and thank them for the great conversations and friendship.